The Disney Store started to focus more on branding itself as its own entity. It sold merchandise exclusive to only The Disney Store, which occasional park merchandise popping up. 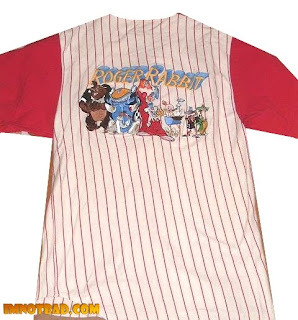 In the early 1990's, a baseball jersey-style line of shirts was released with different characters embroidered on the back. 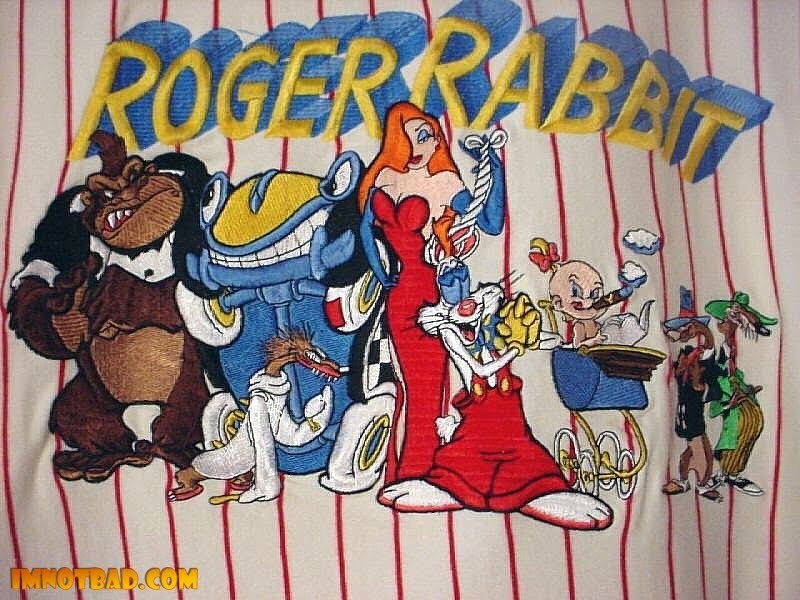 One such shirt featured the characters of Who Framed Roger Rabbit. 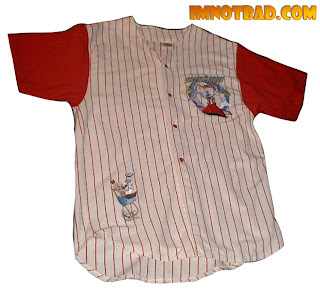 The base color of the shirt is a cream color, with short red sleeves and red pinstripes. It is a button-down shirt made of slightly heavier cotton, more suitable for cooler weather. 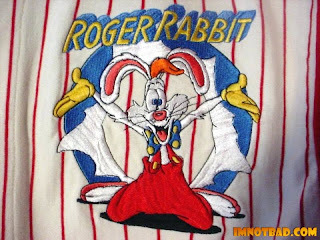 The front of the shirt prominently displayed the star of the movie, Roger Rabbit, on the top left corner, fully embroidered and striking an entertaining pose. 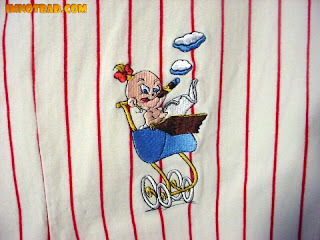 Baby Herman is on the bottom right corner of the shirt, sitting in his carriage, reading the paper - and smoking a cigar (something Disney didn't often portray him doing back then). The back is the best part of the shirt, with a Roger Rabbit logo and full cast of characters embroidered for all to see. 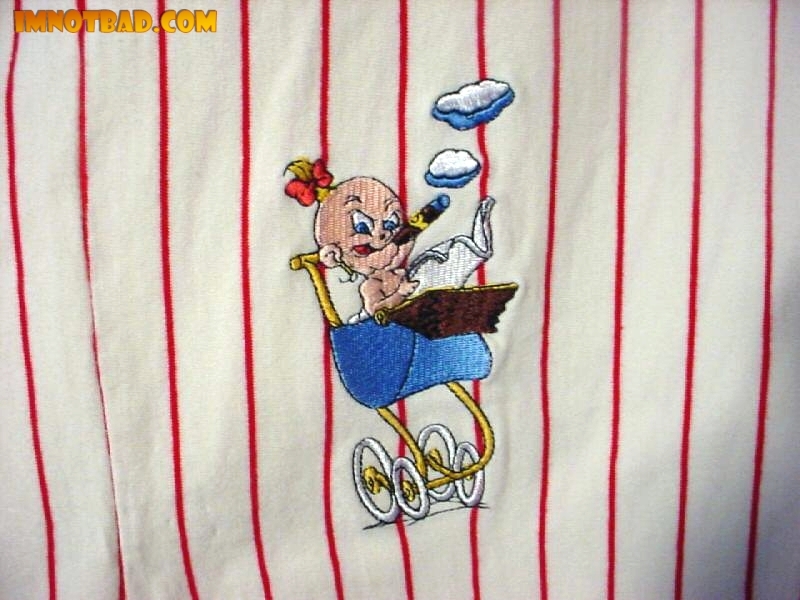 This was how the shirt was displayed in The Disney Store when it was originally released, as it was sure to catch attention. Bongo the Gorilla is first in the lineup. Bongo seemed to be a character Disney wanted to push. He was an original character to the movie and was often seen in early merchandise such as pins, mugs, and shirts. It appears they have scaled down his size for the shirt too. Benny the Cab looks a little different here, as he is standing up - displaying his... undercarriage! He also seems to be in a face-off with Bongo. Psycho weasel is standing below Benny, with his crazed look focused on Jessica. Roger and Jessica are in the center of the shirt. Jessica is standing with one hand on her hip, and the other twirling Roger's ears together. Jessica's gloves are blue instead of purple, though it is not much of a gripe. You might recognize this image of her used on the Roger Rabbit Nintendo game box. 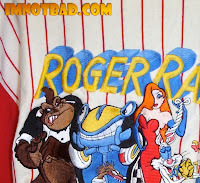 Roger is looking up at Jessica with hearts in his eyes, swooning over his toon bride. Baby Herman looks over at them - and though this is the same image of Baby Herman used on the front, his eyes are in a different position here. Boss weasel and Greasy weasel are at the end. Boss weasel has been given a different colored suit. It is supposed to be pink, but instead, his hat is light blue and jacket is black (which is odd since his tie and hat trim are pink). Stupid and Wheezy weasel are oddly missing from the cast. In spite of some minor details, this is a fantastic shirt. When it was released in the Disney Store it sold around the $40 range, and can sometimes be found on eBay from time to time. The Roger Rabbit Baseball Jersey shirt gets a 4½. 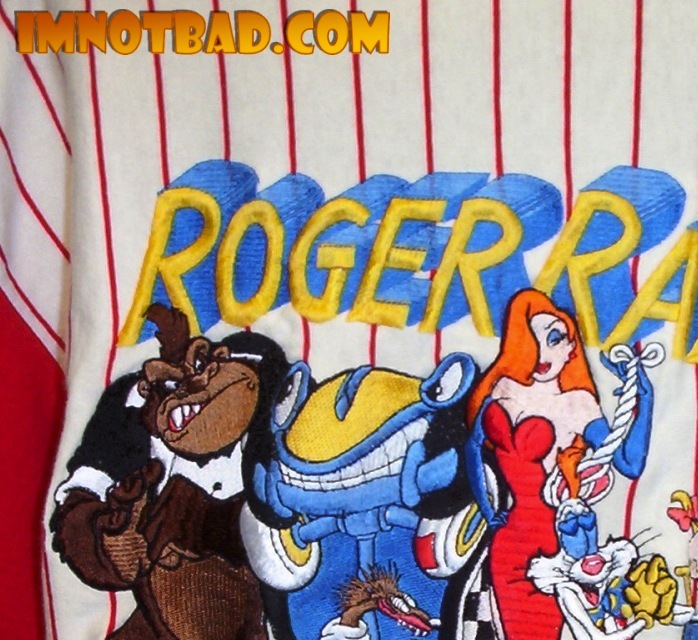 It's an awesome shirt that everyone can wear, featuring the cartoon cast fully embroidered on the back.